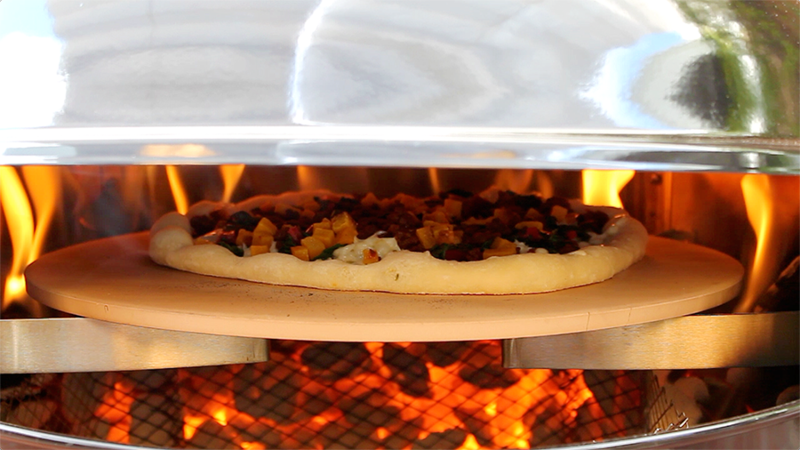 The PizzaQue Pizza Kit for Kettle Grills is the perfect way to turn your backyard barbecue into a wood fired oven. When the kit landed on store shelves last year, we detailed kit components, and how to use it in a blog post. 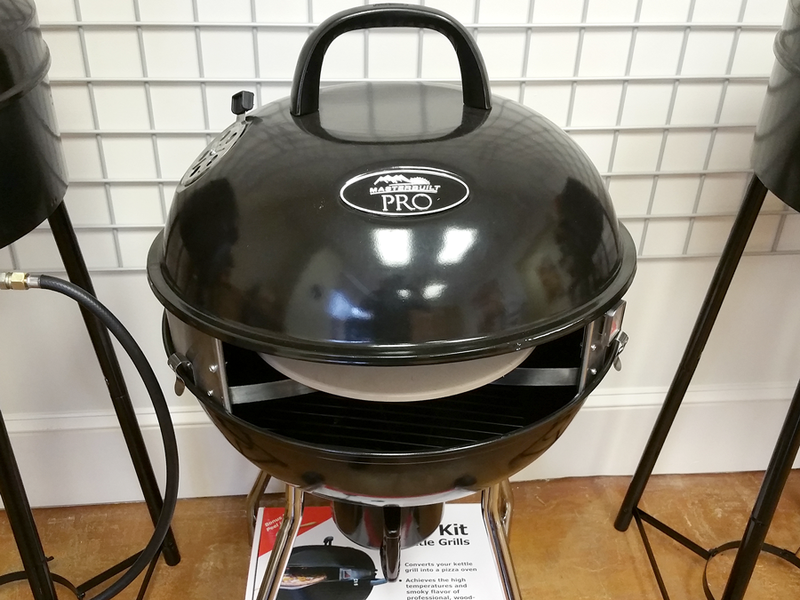 The number one question we've had from customers so far is, How well does the kit fit into different brands or types of grills? Fortunately for everyone, the kit was designed with multiple grill types in mind and has a few different configurations to accommodate varying kettle sizes. The most important part (especially when considering fitting issues) of this product is the pizza kit insert. 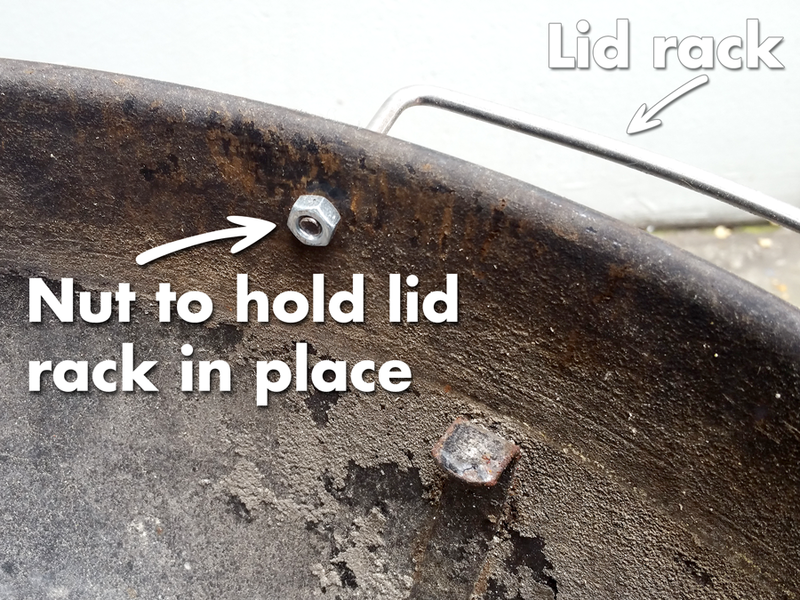 The insert clips on to the lower portion of your kettle grill and also holds the grill lid seated on top of it. On the front side of the insert, there’s a wire frame opening to allow you to place pizzas on the stone. This piece of the kit has two possible configurations, one that fits 18.5” kettle grills, and another that fits 22.5” kettle grills. This is made possible due to the fact that the insert is assembled using three panels, one of which is not used during assembly to fit smaller 18.5” grills. Some grills, like this one, feature a rack that holds the lid during cooking. If this is the style of grill you have, don’t worry, the kit will still install just fine. In the photo below you’ll notice there’s a nut holding the lid rack to the lower portion of the kettle. To get the kit to seat properly, you’ll have to squeeze the insert on both its left and right sides so that it will slide down over the nut that secures the lid rack. It may feel like a tight fit, but the insert will still perform like normal despite the nut being in the way. 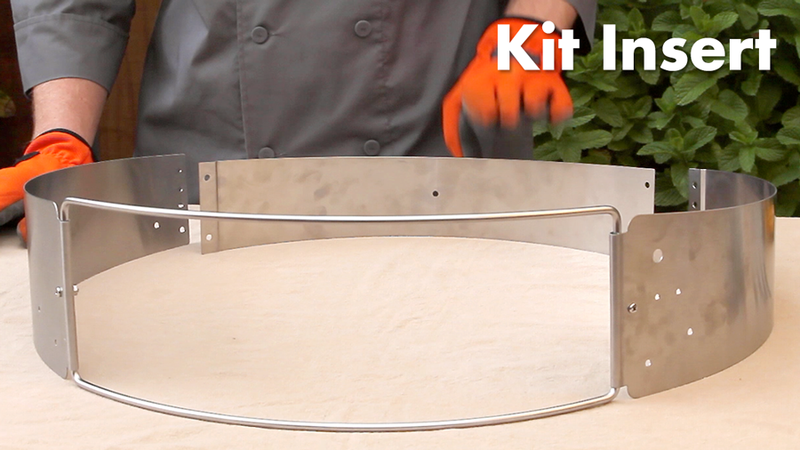 The other component of the pizza kit that’s adjustable is the charcoal fence. 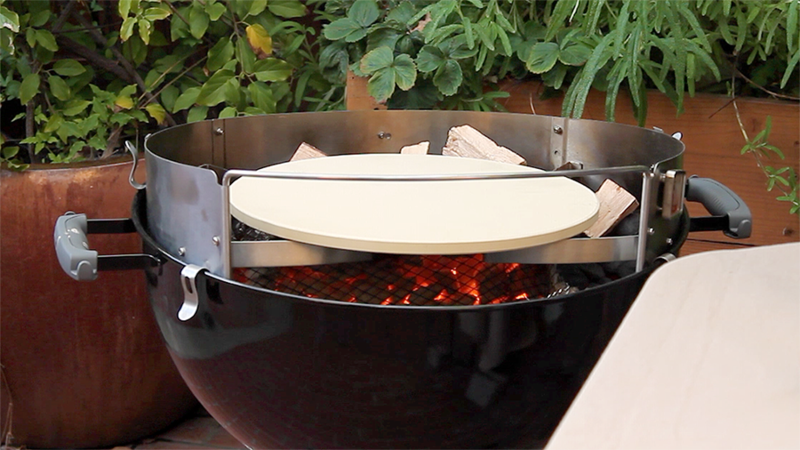 The fence is placed directly underneath the pizza stone and insert and keeps the coals right where you need them, around the edge of the grill. This helps to keep the stone from overheating during extended pizza cooks. 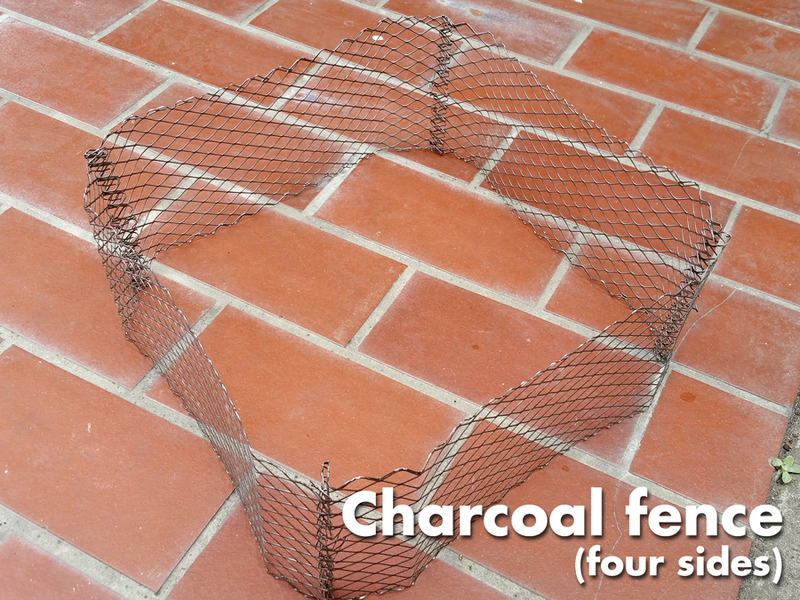 For full sized 22.5” grills, the full four pieces of the fence should be connected together to form a box. For smaller 18.5” grills, only three pieces are needed to form a triangle that will better fit in the space below the grill grate. 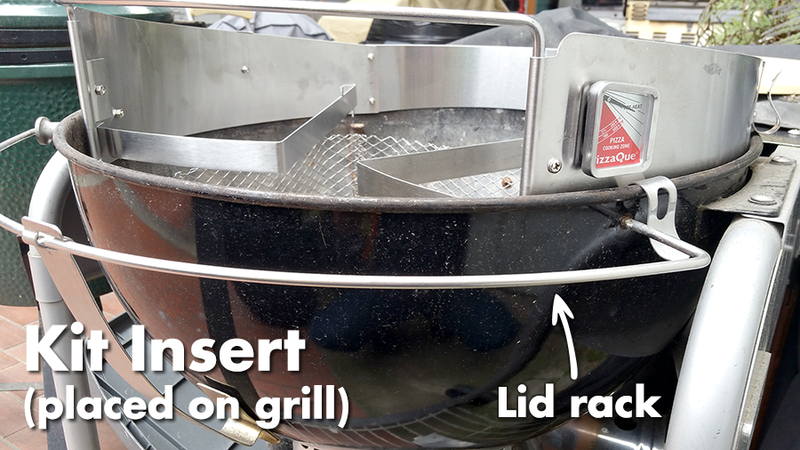 If you’re the proud owner of a new MasterBuilt grill from Home Depot, we’ve included instructions on how to configure the insert for the best fit. Check pages 8, 11, 14 and 15 of your owner’s manual for specific details on how to set things up. Don’t forget, you can use wood chunks on top of the burning coals to kick up the heat even further. Pizzas can take as little as three minutes to bake when using wood! With a few minor adjustments and a little bit of practice, you’ll have restaurant quality wood fired pizza from the comfort of your own back yard! Tagged Charcoal, Pizza Kit, PizzaQue, Products. It was a little fussy to assemble, but didn’t take long at all. I didn’t preheat enough for the first pizza, so it wasn’t great, but the second one was looking fine…until this huge black bear came around and I ran inside closing and locking all the doors. I was pretty jumpy trying to turn the pizza and finish cooking it. It was pretty darn good. I’m eagerly anticipating the next wildlife free pizza!